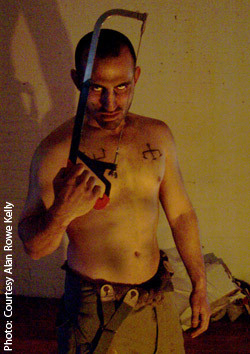 "THE BLOOD SHED" DVD RELEASE DATE - SEPT. 25, 2007! Fangoria.com has just announced the release of "The Blood Shed" on DVD! Read the article here, or read it below! Indie filmmaker Alan Rowe (I’LL BURY YOU TOMORROW) Kelly gave Fango the word that a new official website has been launched here for his over-the-top horror feature THE BLOOD SHED, and revealed that it has been picked up for DVD distribution by Heretic Films, which also released TOMORROW and plans a September 25 debut. “THE BLOOD SHED is true independent horror, with some of the best names and talent the East Coast community has to offer,” says Kelly, who last discussed the movie with us here. In addition to writing and directing, he also stars as one of a family of demented hillbillies who torture a series of victims, along with Terry M. West (director of FLESH FOR THE BEAST), AUNT ROSE’s Joshua Nelson (pictured), Mike (THE TENEMENT) Lane, Susan (Mingle Mangle) Adriensen and Robert Norman.